A few days ago, on the very day I pledged to reduce my personal book buying budget to $0 for the coming year, a little surprise came in the mail: a $25 gift card. Ordinarily, this kind of thing is just something to laugh off and not worry about, but the whole situation made me think seriously about gift cards, and it made me realize that there are a lot of interesting little problems related to them. Should you use a gift card as soon as possible after receiving it? 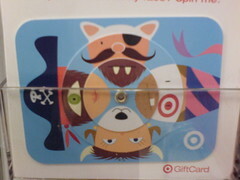 I’ve come to believe that this is the optimal strategy for gift card use. Why? First of all, if you don’t use it, you tend to forget about it (and potentially lose it). According to the Seattle Post-Intelligencer, “More than 10 percent of the $58.3 billion in gift cards bought [in 2006] won’t be used”. Why? Often, it’s because they’re simply lost or forgotten about in a desk drawer somewhere. I know that we had a spa gift certificate for years floating around – it finally got lost in the move. A second factor to consider is inflation. Let’s say, hypothetically, that you have a gift certificate worth $100 to a health food store. With inflation at 9%, if you hold onto that card for a year, you’ll only get roughly $91 (in today’s dollars) worth of stuff when you finally use it. Our spa certificate was for $50 off a couple’s massage – when we received it, the couple’s massage at that spa was $89. Now it’s $129. My advice? If you have a gift card, use it as soon as you can. This eliminates the risk of forgetting about it or losing it and also prevents inflation from eating away some of the value of the card. How should you handle spending “over” the amount of the card? I know that if I walked into a bookstore with a $25 gift card, the likelihood is that I would spend some small amount over the value of the card just to make sure I used all of it. If not, I’d keep the card around in my pocket and then use it in such a way in the future. In either case, the presence of a gift card often subtly encourages us to spend money we wouldn’t otherwise spend. I often use them as justification – I can now get this $29.99 item I don’t really need for only $4.99! – for completely unnecessary purchases. What’s a good strategy to adopt here? Go with a friend or two and then spend less than the value of the gift card. Then, if your friend is also making a purchase anyway, slip them the remainder of your card. Not only will they appreciate it, you also won’t find yourself stumbling to spend the last little bit of that gift card. What if you don’t want the gift card at all? Not too long ago, I won a gift card to Sephora. For those unaware, Sephora is a store that sells cosmetics. What use could I have for such a card, really? I’m a guy living in Iowa who prefers to dress in blue jeans and comfortable shirts. You have several options here, but my favorite is to simply re-gift such a card. Find someone you know who might actually use the card and give it to them, either for a gift-giving occasion or just because you can. This either serves a purpose of giving you a very inexpensive gift for someone or else helps you cement a relationship with someone. In either case, it’s an added value for you. In my opinion, gift cards only work as a gift if you know they fill a specific desire of a person. Give a book lover a gift certificate to a bookstore and they’ll love you for it (especially if you’ve slipped it inside a gift of a paperback you think they’ll love or one that holds special meaning for you). Give it to someone you don’t know well and they’ll probably just shrug their shoulders. If you’re in a situation where you’re giving someone something as generalized as a Target gift card – one that doesn’t match any sort of specific interest or attribute about the recipient – just give them cash. Cash is the gift card that works anywhere, after all. As for my book store gift certificate, I’m going to hold onto it until the end of my pledge. Using it now seems like cheating – and a sure way to convince myself to spend a little more and completely destroy my pledge.